Even though I think life and reality is pretty fascinating , I love to go and sit somewhere quiet, all alone, and read a bunch of stuff that is totally made up and often structured in a fairly predictable way. Why is that? What’s so pleasing about reading fiction stories? George Lakoff might have uncovered one explanation for this strange thing we do. In an interview on Point of Inquiry, he overlaps the fields of linguistics and cognitive science to explain how narratives and cognitive metaphors (the broad metaphors that describe views on life ) can physically affect our brains. Influencing people by intentionally framing information in a particular way is nothing new (not in politics any), but Lakoff is suggesting that the metaphors of our childhood can drive us to subconsciously seek out similarly structured ideas about the world. Lakoff mostly discusses cognitive metaphors in terms of politics. He sees America’s political arena as largely based on the opposing family metaphors of childhood: children who grow up in households that uses the narrative of “father as strict protector” feel more comfortable as adults with political parties that promote government as a strict protector (hello, conservatives); and children who grow up in households with “parents as nurturers” narratives prefer a government that acts as a protective nurturer (hello, liberals). 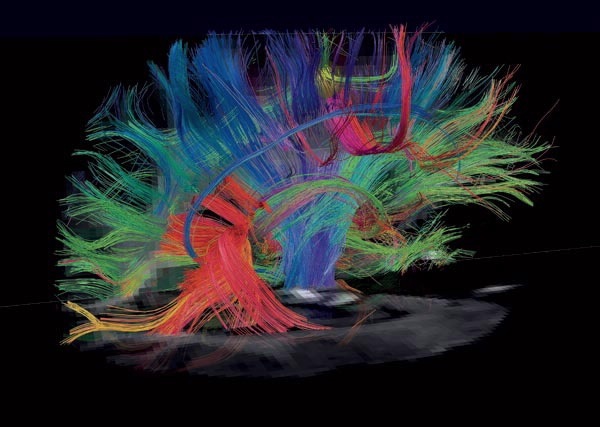 Diffusion spectrum imaging showing just a portion of the neural structures of the human brain (MRI imaging developed by neuroscientist Van Wedeen at Massachusetts General Hospital). This, he says, is because our early narratives lay down the foundations of certain chemical pathways in our brains, and then as we grow and develop, we tend towards similar ideas that echo these patterns, reinforcing and strengthening them. Presumably this why adults who have a long association with a particular political party or issue find it difficult to empathize with the opposing side or see the other’s perspective; in fact they can barely conceive of how such idiotic ideas can exist inside their rival’s heads. This is also why we can’t easily change someone’s mind to see our point of view … we probably need to change their brain first! The longer we mooch through life running similar ideas over similar ideas, the more hardened and concrete these pathways become. They form our unconscious biases, which are very difficult to change without a profound, life-changing experience or a sustained conscious effort at critical thinking. All fiction is metaphor. Science fiction is metaphor. What sets it apart from older forms of fiction seems to be its use of new metaphors, drawn from certain great dominants of our contemporary life—science, all the sciences, and technology, and the relativistic and the historical outlook, among them. Space travel is one of these metaphors; so is an alternative sociey, an alternative biology; the future is another. The future, in fiction, is a metaphor. Maybe part of the pleasure of reading similarly structured narratives (with inventive and varying details) is that we are mentally echoing the metaphors we like the best … those that fit with our views on life. It’s not that we dislike stories with new ideas, surprise twists or secret doorways (we love those! ), but maybe to experience the new ideas, we need to know that the metaphors will fit. Perhaps genre is just a way of sizing this up.